This decadent French toast has it all. 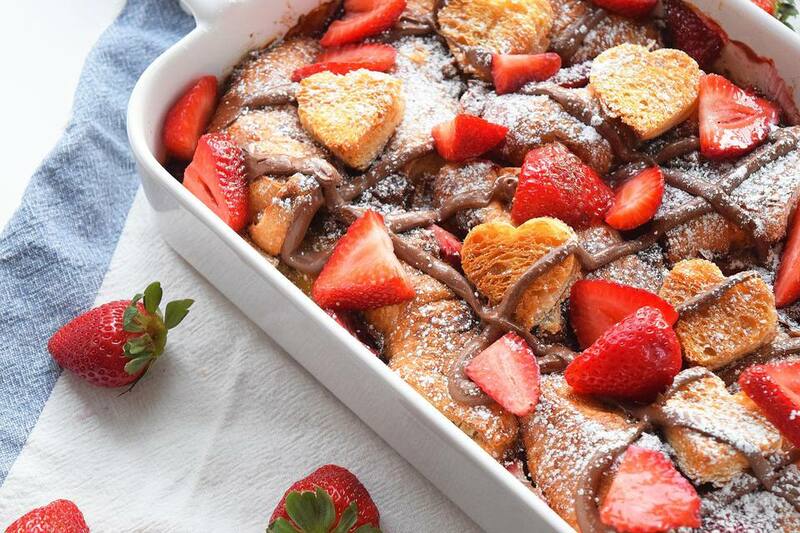 It's made from buttery croissants stuffed with Nutella and cream cheese, and is smothered in strawberries. Yes, please! Not only is it sweet and delicious, it's also super easy to make. It can be prepared as an overnight French toast bake. Simply assemble the French toast in a baking dish, cover with aluminum foil, and leave it in the refrigerator overnight. Pop it in the oven in the morning and you've got a delicious breakfast waiting for you. It's a perfect splurge for Valentine's Day. You can cut out some little heart shapes from part of one of the croissants with a small heart cookie cutter, then place them on top of the bake for the last 20 minutes. Combine the cream cheese and Nutella in a bowl until totally combined. Spread 2 tablespoons of the mixture in between each croissant half. Grease a baking dish with butter and place the stuffed croissants in one layer in the dish. Pour the egg mixture over the top of the croissants. The egg mixture will sit about halfway up the croissant sandwiches. Cover with aluminum foil and refrigerate for 4 hours or up to 24 hours. Use a spoon to spoon some of the egg mixture that may have pooled at the bottom onto the top of the croissants again. Toss the strawberries with the tablespoon of sugar and spread over the french toast. Drizzle with more Nutella and serve! It's a good idea to let the croissants get a little stale before making them into French toast. If they are a little stale or dried out they will soak up more of the liquid in the casserole dish. If your croissants aren't stale, not to worry! You can leave out a 1/4 cup of the milk from the egg mixture. Or you can also dry out the croissants in a 350 F oven for 15 minutes. Brioche or other rich breads are also delicious in this recipe!